The flexible circuit wrapped around the metal and was attached to the foam in back. 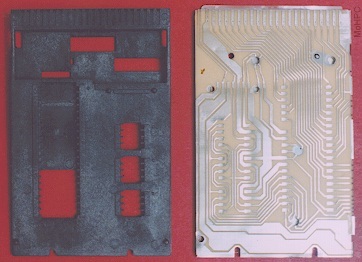 A hard plastic backbone held the chips in place on the flexible circuit with the foam supplying pressure against the circuit under the chip leads. The chips were NOT soldered to the circuit! Unfortunately, the original design didn't measure up to the reliability of earlier HP calculators so HP redesigned the 30 series interior. 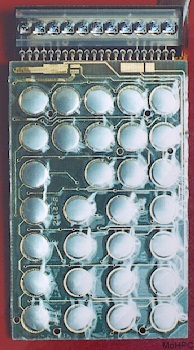 The redesigned models used a more conventional design with a single rigid circuit board with snap disks on one side and ICs soldered in place on the other side. 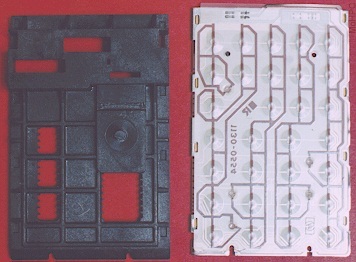 A plastic spine provided extra rigidity but didn't hold the chips in place as on the earlier version. These later models weigh about 1.5 oz less due to the removal of the metal sheet. Information on the register layout and programming model may be found on the CPU and programming page. The series series improved the display by increasing the digit size and adding commas. In addition, the display was angled to be more readable on a desktop. The 30 series returned to using a separate battery and battery door. The curator considers this a shame as the 20 series pack seemed so clever. 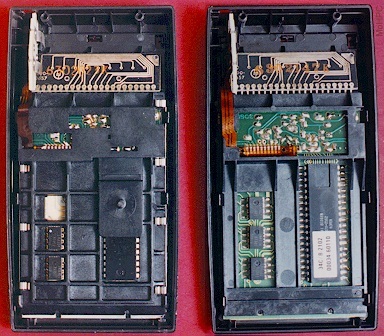 Collectors are often annoyed to find 30 series models without battery doors because without a battery in place, the doors fall off rather easily. Another flexible circuit was used to connect the battery terminals to the calculator circuitry. A "Bright Metal Alloy" replaced gold for contacts.